Sunshine and coffee, both key. That kind of rugged backpacking always sounds "cool" no matter how (un)willing you'd be to do it yourself. Actual footage of Andrew on his first trip, hitchhiking with random kids he met in Ireland. 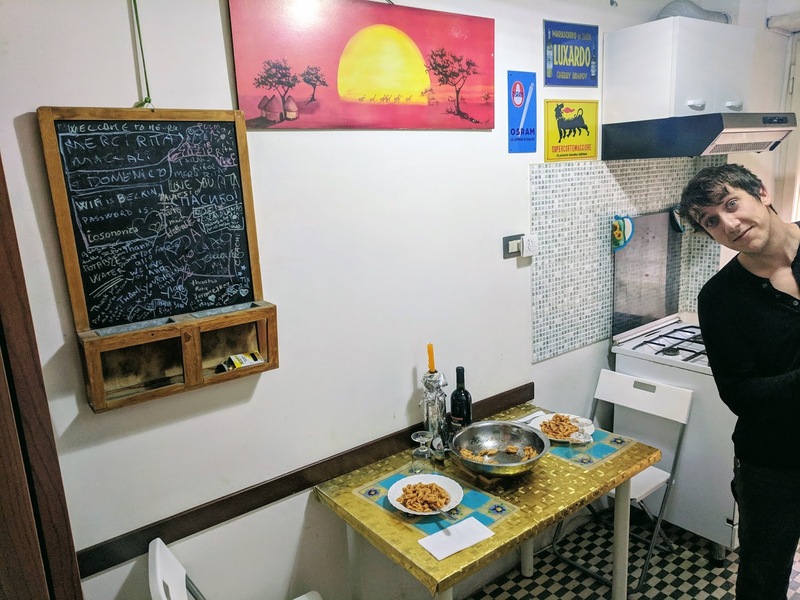 Back then, I, however, had never been outside of the United States, except maybe for Canada, and had only ever used Airbnb once or twice, let alone hostels or Couchsurfing or Workaway. 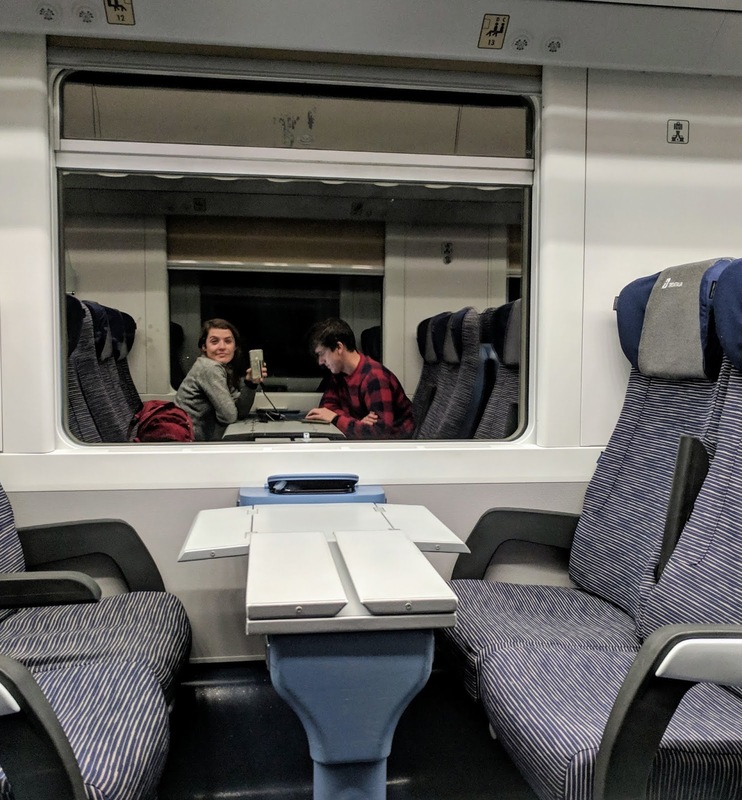 In those early days of dating, I made it clear that I was down to see the world with him, and he made it clear he could not picture a life for himself without frequent travel. Five years later and here we are, so we've both made good on our promises, but there is a big, major, distinct difference between laying on the couch in your pajamas, dreaming of all the amazing places you'd like to see together... and lugging your 65 liter pack around as you wander aimlessly through the cold, dark, eerily quiet city of Ljubljana, Slovenia at 3 o'clock in the morning during a two-hour layover between 6 hour buses from Italy to Croatia. 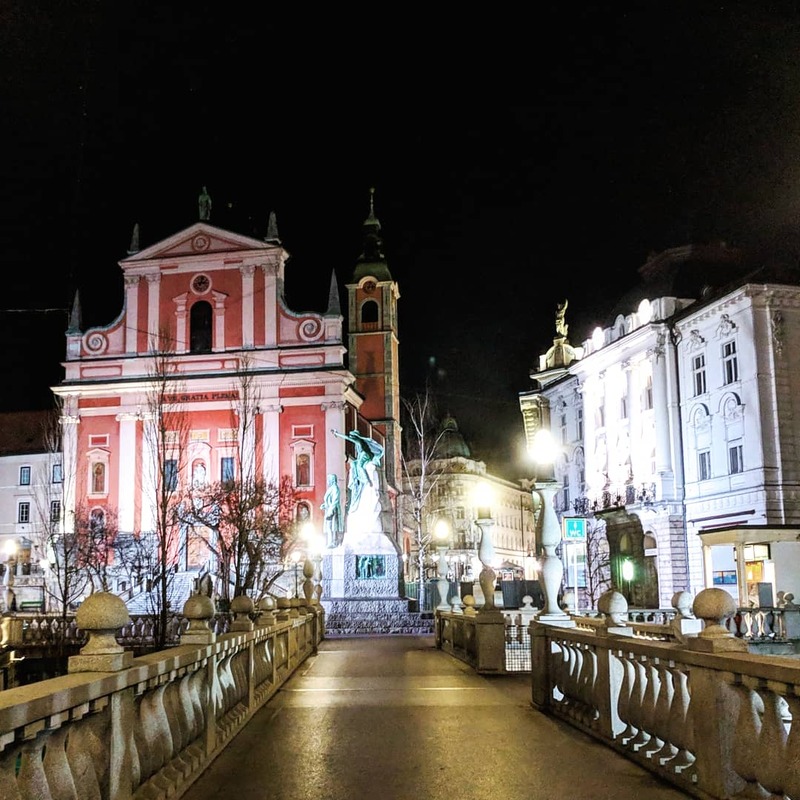 Ljubjlana, lit up at night. Packing for a year is really hard, and there's no possible way around the fact that I'm so sick of the clothes I have to wear. Two long-sleeve work shirts, two sweaters, three t-shirts... And when the weather stays the same for long periods of time? We have long (long long long) passed when alternating between two or three options got boring. But it's also not financially worth it to replace what I currently have simply to have something new, so we've got a few more months to go featuring the same outfit over and over again. I swear we didn't take all our Instagram pictures in the same day. There's also the bit where staying with strangers for free in exchange for work or entertainment is rewarding, but super stressful. All the parts of it that are good have a negative to go with it. It's super awesome to get to participate in the different family and cultural rituals that go into daily life in different parts of the world! It's also really hard to relax when you have no idea what the norms are or what's expected of you. It's amazing to have an immersive language experience! And it's really stressful when the most basic of questions ("Um...where can I find more toilet paper?") include a communication hurdle. 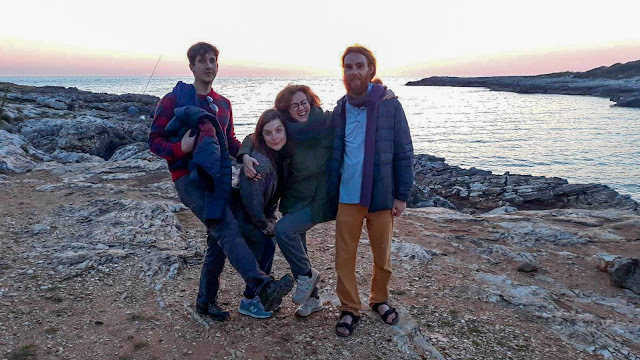 Sandra, who speaks only Italian, and Chris from England at Porto Selvaggio in Italy. - Don't make any half-assed decisions about what clothes/underwear you want to pack, and don't bother packing any clothing items you don't love, because being gone longer doesn't mean bringing more. Make sure all your clothes belong in the same general color scheme, so you can always mix and match items, and they should all be washing machine/dryer safe. And update necessities like rain jackets, even if the 4-year-old one you have still seems functional... (turns out mine wasn't up for the downpour that Rome gifted us with). Oh--and I recommend outer layers be in dark, neutral colors, because I look out of place literally everywhere in the world in my bright blue jackets except for home in the PNW, or maybe Switzerland. It's helpful to not stick out like a tourist. Accepting you'll never look like a local is part of it, but it's nice to blend in just a little bit. - Honestly, buy a backpack that you think is just a little bit too small, and then deal with it. It is likely you will find creative ways to fit more in there. 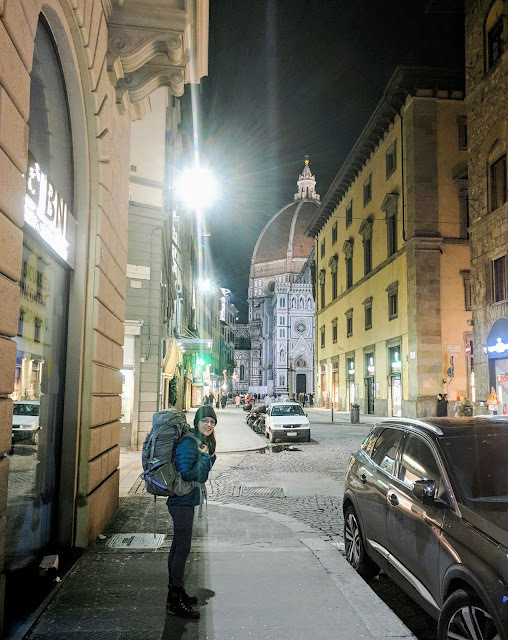 My pack, when full, is definitely too big for me, which not only means it's difficult to carry for very long, but it's nowhere near carry-on size. Does this backpack make my back look sore? - Related to space in your pack: it's super worth it to save a little room in there for food. We've been hauling around a few spices (salt, pepper, paprika, bay leaves) and cloves of garlic that make all the difference in cooking at Airbnbs or hostels. We also usually have some breakfast biscuits and uncooked pasta as we head to new places, just in case. - Always have a portable battery when you go on outings, and always make sure it's charged. This is mostly crucial for us because we use our phones as navigation, but we also frequently rely on hosts for accommodations/rides in and out of town, etc. 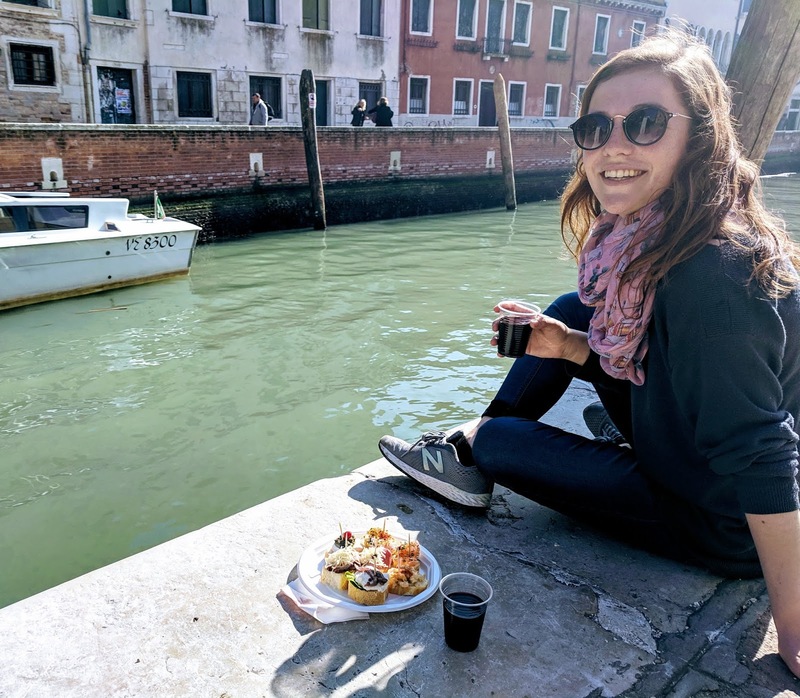 We are usually pretty good about this, but sometimes we get complacent and find ourselves wandering around Venice by memory (not recommended, but we did it) or stressing about getting ahold of Tiziana to be picked up from Nardó with 2% battery left. - On a trip as long as this, it's been so worth it to have a laptop. Andrew did about five months in the past with just a tablet, and he says it almost worked, but it's been so important for us to have the bigger screen and full keyboard. Our Airbnb in Rome was WAYYYY too far outside the center...but our host did make us fresh pasta! - When visiting anywhere for a week or more, make sure your accommodations have laundry access! And that means laundry in the Airbnb, not next door which may or may not be closed for renovations while you are there for two weeks...yikes. I have been working on my old-fashioned washing-in-the-sink skills which is proving more effective for underwear and socks than for hiking pants. - Finally, while sometimes it's nice to have open spots in your itinerary to say yes to unexpected opportunities, it's so much easier to save money when you can look way ahead and plan for challenges. 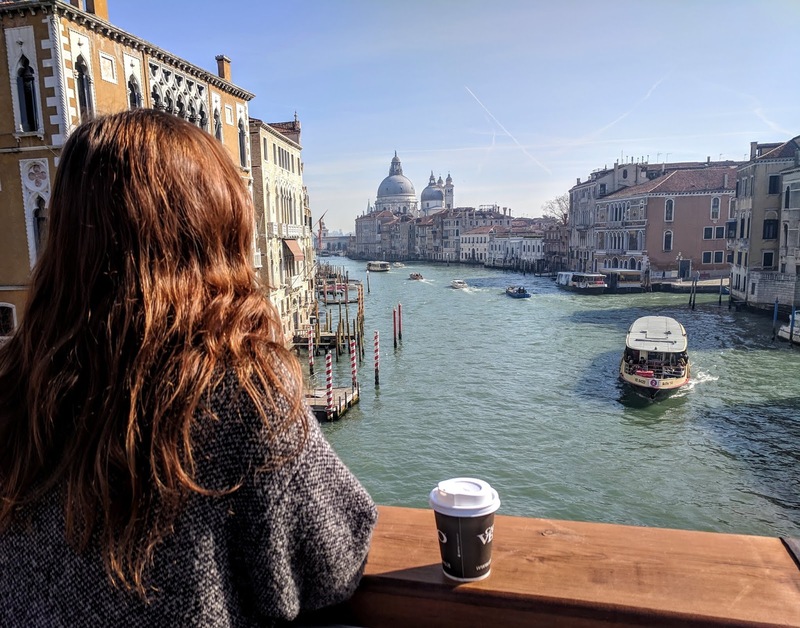 For example, it's technically possible to get from any one point in the world to another, but how much that costs dramatically varies based on your options; sometimes long-term budget travel means going to destinations based on how cheap and easy it is to get there. We didn't plan far enough ahead for our time in Eastern Europe, and found that it's actually super difficult to get from Split, Croatia to Bucharest, Romania once we were already in Zadar; instead, we're now taking a longer route through Sarajevo, Bosnia and Belgrade, Serbia based on bus routes and prices. Of course, the flip-side of not planning (and backing yourself into a corner) is problem-solving to include unexpected stops that turn out really cool--we are now quite excited to get to see a little of Bosnia and Serbia. We maybe wouldn't have thought to include those places had there been a direct route into Romania that we could afford. Despite its challenges, traveling long term like this allows for some real flexibility that you just don't get when you are on a 2-week vacation time-crunch. Hopping from one new place to the next every few days is unsustainable even for a two week trip, but if you have the time, settling into a Workaway or cheap Airbnb for a few weeks gives you a chance to get comfortable and find your bearings. If you're in bed sick for a couple of days, you didn't necessarily miss out on the whole destination. You're more likely to finally get the hang of the public transit, some basic words in a new language, and to taste really good local food. For us, it's also meant exploring off the beaten path a little, away from the usual busy tourist spots. At this point, approaching our six-month mark on this trip, we have learned so much--way more than can fit in a post on this topic--and we still have so much more to learn. Every bit of it is worth it. Love this piece. You guys have clearly seen the good and the no-so-good of travel, but always seem to make the best of it. Also, love the part of the laptop. I was anti-laptop for awhile, but just finally caved and it's such an upgrade. Keep exploring! Your kind words are super appreciated! Thank you, and best wishes to you!